Asus have announced a couple of new cards based on the ATI X1600, available towards the end of the month. The 'EAX1600Pro/TD/256M' is a X1600 Pro card, as you might expect, and is clocked at 500/780. It has a fairly standard-looking heatsink assembly. The EAX1600XT/TVD/256M is an XT part, and is clocked at 590/1380. 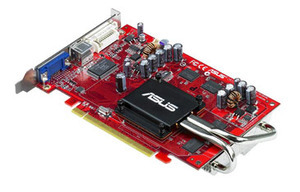 In contrast, it sports a new passive cooler designed by Asus. The passive cooler moves the heatsink round the back of the card, working on the principle that a) hot air rises and b) that's where your case fan will be. 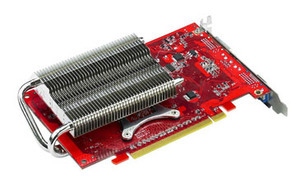 We think the heatsink is a little reminiscent of the cooler on the Shuttle SLI system, which we reviewed here. No word on pricing as of yet. We'll be pestering Asus to get samples over to us as soon as possible, so that we can give you the low-down on whether or not these babies make the grade. Does the X1600 float your boat? Is this the passive card of your dreams? Let us know in the News Forum.